What’s the #1 must know factor when choosing your off grid home’s windows and doors? 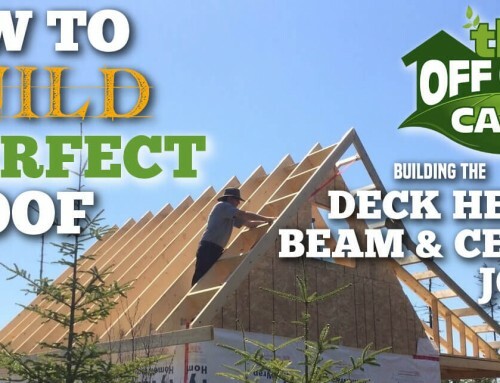 When it comes to picking window and doors for your off grid home there are several important factors to consider. But there’s one in particular that outweighs the rest and should be your number one consideration. What do you think is the most important factor for an off grid home window or door? Design, cost, warranty, appearance, security, solar heat gain coefficient… sound insulation? Whether it’s an off grid cabin, a summer cottage, an all season tiny house, or a residential home we believe energy efficiency is the single biggest factor to consider. You want your home’s living environment to be cool in the summer and toasty warm in the winter and the windows play a major role in maintaining both. Indoor heat can be a labor intensive commodity off grid and we know all about that. But did you know that up to 50% of your heating is lost to your windows! When choosing your homes windows and doors consider all these factors and you'll make your selection a breeze! 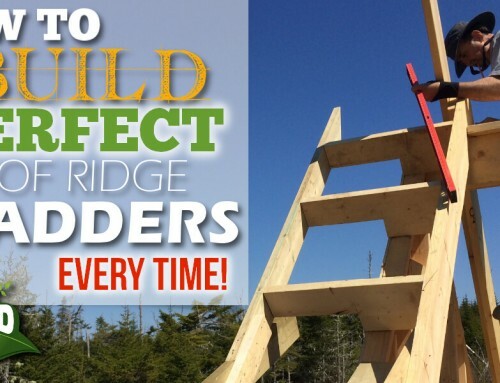 As you may know we’re building our own off grid cabin on the Canadian East Coast where temperatures can range from +38 degrees Celsius in the middle of summer to -40 degrees Celsius in the dead of winter. Installing windows and doors is a straightforward and simple process given that you’ve constructed the openings correctly during the framing process. 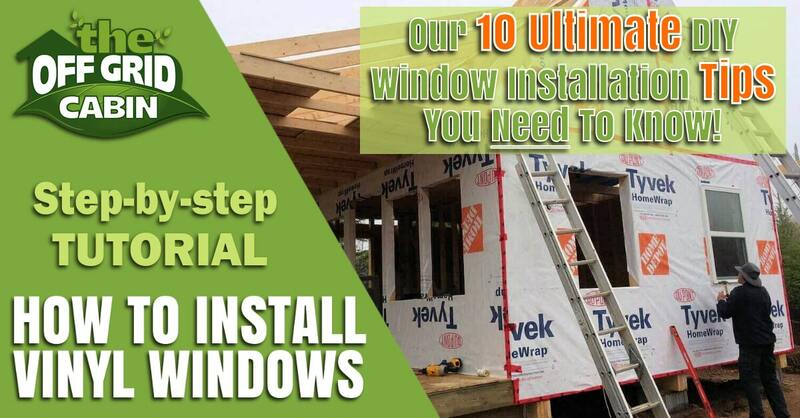 Once you’ve installed your first window, the rest will take far less time. Installing vinyl windows, say ten or less, can be done in less than a day and with very few tools. We’ll teach you everything you need to know right here. Windows come in a vast range of types, sizes, shapes and costs. Traditionally, most windows were comprised of a wooden frame, single pane and were either single-hinged or sliding. As new improvements were made, pivot hinges and friction mechanisms became the norm. Single panes became double, triple and more. The wooden frame gave way to lighter, less bulky aluminum. Today vinyl windows are the most common here in North America. Styles range from a simple non-sliding window, to elaborate double hung picture windows with colonial inserts. When living in off grid environments we found that vinyl is the best choice when compared to the other types of window materials because of its low cost and energy efficiency. Because it’s made from polyvinyl chloride (PVC) it has a high R-value, which means it provides a significant amount of insulation. Price and energy efficiency are just a few advantages of vinyl windows. Like windows, doors come in a plethora of styles, colors, materials and features. How much weather will your door be exposed to? Do you want the door to provide additional light? Do you want to paint or stain your door? The majority of exterior doors today are constructed of steel, fiberglass, or wood. Steel doors have an energy efficient core and are weather stripped by the manufacturer. They are resistant to swelling/warping and relatively maintenance free. Often a steel door comes predrilled for hardware and a pre-hung door makes installation a breeze. Fiberglass doors offer the same energy saving qualities of a steel door, resistant to weather, but are more resistant to scratches and dents. They come pre-drilled and are available pre-hung. They can also have a wood like textured finish, which when painted looks like the real thing. Most steel and fiberglass doors have an R-value of R-5 to R-6 (not including the effects of a window). A 1 1/2 inch thick steel door, with polyurethane foam core, offers more than five times the insulating value of a solid wood door of the same size (energy.gov). Choosing appropriate windows and doors for your climate zone, along with proper installation, will save you time, money and maintenance over the lifetime of your home. Considering most people heat their off grid home with wood and/or gas (natural gas of propane) it’s essential that your windows and doors are installed properly to retain the heat in the winter and help keep it cool in the summer. During the winter months at our cabin we use a small direct vent propane wall heater from Empire, model DV215 (15,000 Btu). We use an Emerson low voltage digital thermostat to keep the cabin at 10 degrees Celsius while we’re away. While living at the cabin we have a Drolet Pyropak wood stove (40,000 Btu) for heat. The windows we choose are relatively inexpensive, require little to no maintenance and their energy rating make them excellent at preventing heat loss. What Makes A Window Efficient? Energy efficient windows have several key features which greatly improves their efficiency. Two, three or more panes with an air-or-gas-filled space provide greater energy-efficiency. Special coatings (known as low emissivity coatings, or “low-e glass”) and insulated frames and sashes mean your window will be more comfortable to sit beside and reduced condensation. Available triple glazing for better exterior noise reduction and even more energy savings. Consider using higher insulation value doors and windows that are exposed to high north and east facing winds. As you may recall from our post Delivering 20K lbs Of Building Materials Off Grid we purchased all our building supplies, including the windows and doors, from Home Depot. The windows we choose are made by JELD-WEN. We choose to go with ENERGY STAR qualified low-E single-hung vinyl windows with fiberglass mesh screens. What Was The Total Cost of Our Windows? Our cabin has a total of nine windows. 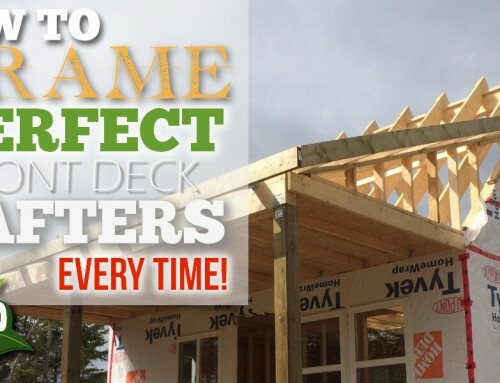 WANT OUR COMPLETE MATERIALS BUILD LIST? If a picture is worth a thousand words a video is worth a million. Here’s our favorite “go-to-how-to” handyman Shannon from House-Improvements.com demonstrating a PVC window installation (to code) and using additional weather proofing materials to ensure a permanent leak-proof install. What Was The total Cost Of Our Doors? Our cabin has a total of three doors. One exterior front door and two interior sliding pocket doors. The sliding pocket door is perfect for saving precious space in a small home while still maintaining privacy. Again, our favorite “go-to-how-to” handyman Shannon from House-Improvements.com demonstrating an exterior steel door installation (to code) in new construction. Here's a FREE downloadable PDF of the complete cost breakdown of our cabin! Send Me The Complete Cost Breakdown! 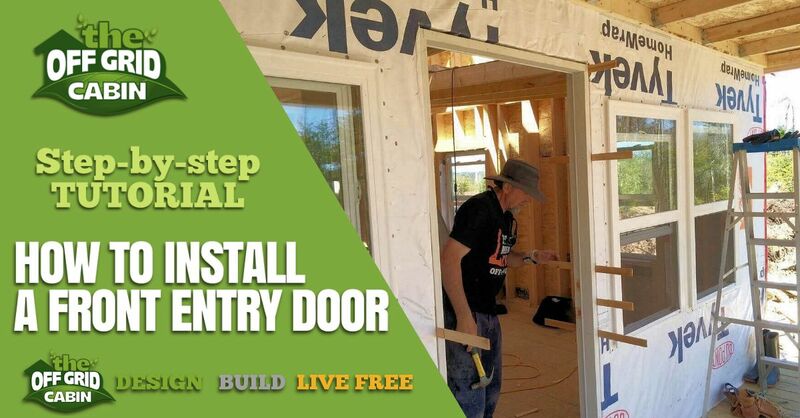 There’s a lot that goes into selecting the appropriate doors and windows for your off grid build. From the design, cost, warranty, security, to solar heat gain coefficient, sound insulation and appearance… it ALL matters. In our next post we’ll share with you our exact build process for the windows and doors and of course photos of the entire process. Be sure to SUBSCRIBE if you haven’t already so we can walk you through the entire build of our 20ft x 24ft solar powered off grid cabin! 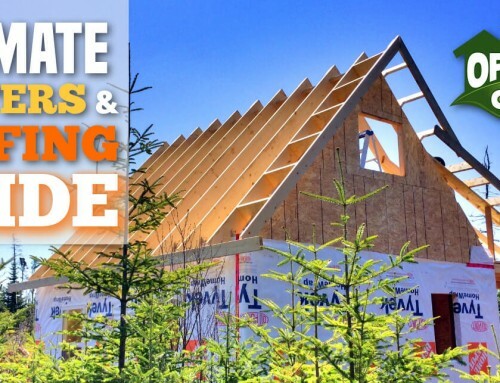 Ready To See The Detailed Window Installation Guide? TAKE ME TO THE WINDOW INSTALLATION! Do you feel ready to tackle the selection and installation of your homes windows and doors? Don’t forget to subscribe so we can stay connected and I’ll send you ALL our off grid goodies! Oh, and yup…. you guessed it! We have a special Pinterest pic for all our devoted Pinterest pinners out there.